Kintoki is refereeing a match between a monkey and a rabbit. 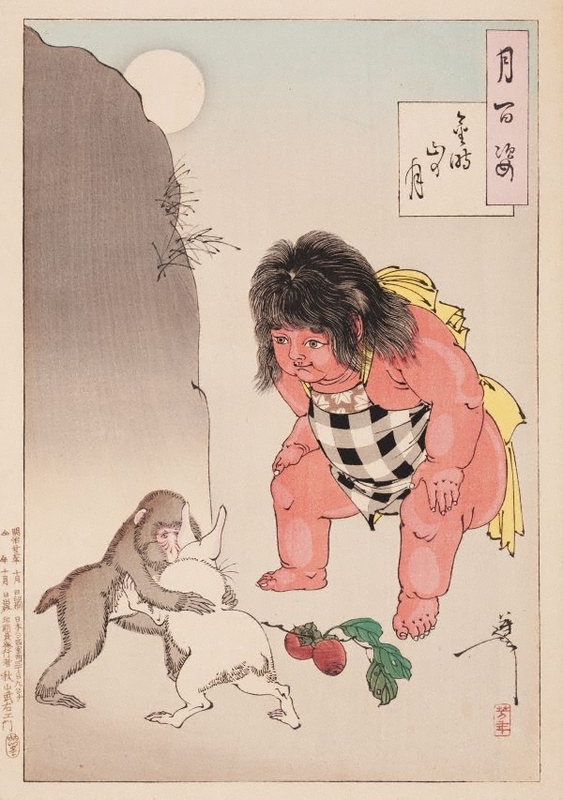 He is depicted here as a fattened infant, which traditionally meant good health in Japanese and Chinese culture. The persimmon is perhaps an allusion to what the monkey stole from the immortals in heaven and Kintaro’s superior powers. Kintoki was the son of a 'rōnin' (or masterless samurai) and was abandoned in the Ashigara mountains, near Mount Fuji. Brought up by Yamauba, who was half-woman, half-spirit, she called him ‘golden boy’. The warrior Yorimitsu saw the child while he was hunting and wanted to take him away and make him a hero. His name was to change again, to Kintarō, once he became a man.